Daughter of Mine is off to Hogwarts soon and she needs a schoolbag. Specifically, she wants a vintage satchel-style bag, just like everyone from Hermione Granger to the cool kids of Brighton seems to have. When I was at school, it was only the geeky bookworms who had leather satchels. That’s still the case, but the crucial difference is – it’s a good thing. Geeks have inherited the earth, and it’s cool to be a bookworm now. And so satchels have been featured everywhere from Elle to Vogue to The Guardian. They’re very much the ‘in bag’ of the moment, and definitely not just for schoolkids. 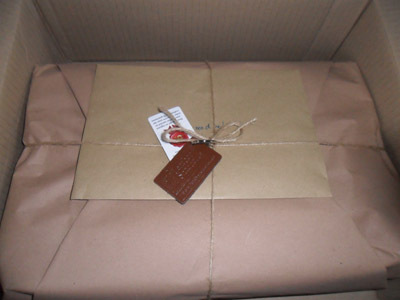 And then The Leather Satchel Company, a Cheshire-based company that’s been making satchels since the 1960’s, got in touch and sent us a beautifully packaged parcel. What a gorgeous beast. Do I really have to give it to the child? From order to delivery took under 5 days – quite impressive when you consider that this included getting it personally monogrammed. A satchel like this one is normally £104, currently reduced to £75.60 on Amazon. Yes it’s a lot for a schoolbag, but for a well-made, classically stylish item that is guaranteed to last for years? Not so much. We were looking on ebay before we got this, and even second-hand satchels go for at least £40, so I think this is well-priced. 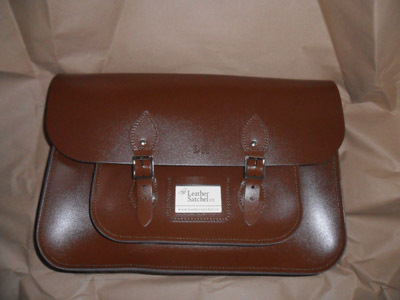 My daughter is still using her satchel every day, and because we love the Leather Satchel Company brand so much we have agreed to become affiliates. What this means is that if you quote our code when you order, you save money and we get a small commission. The good thing about dealing with the company directly is that you will be able to arrange having your initials on your satchel, and will have access to the widest range of colours. They have some fantastic new colours added to the range now. I love the metallics, and if I make any money as an affiliate will probably end up investing it in one of those.